Operation HOBART was mounted on the 24th July, 1966, to the east of the Task Force Area. The mission was to search and destroy the enemy in an area to the north-east and east of Long Tan and to search Long Tan itself for installations and caches. The Battalion returned to base on 29th July, 1966. There were two major actions, both occurring on 25th July, 1966. At 1308 hours C Company engaged an enemy force of company strength. The engagement lasted for about thirty minutes with the result that the enemy were finally forced to withdraw south, after being subjected to small arms and artillery fire. 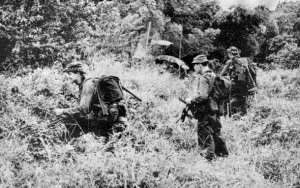 The Viet Cong in return engaged C Company with small arms and mortar fire. B Company meanwhile had formed a blocking force across the likely withdrawal route of the enemy engaged in C Company's action. The Viet Cong took this route and were observed moving towards B Company's positions by the sentries. The company engaged with small arms and artillery fire; the Viet Cong were in a bottleneck; their main avenue of escape was blocked. Having fired mortars, the Viet Cong assaulted, only to be repulsed by the small arms fire of B Company, and the very close support given by the Artillery. The enemy broke off the attack and withdrew to the south and east. The Viet Cong used bugle calls for the passing of orders, and these calls echoed many times over the battlefield. Up to the time of these actions the Battalion had moved as silently as it could and consequently was able to surprise the enemy. There were small contacts after the engagements on the twenty-fifth with small groups. From the extensive camps and caches found, the area obviously had long been a transit area for the Viet Cong, but now with our presence in the area he would be forced to use new areas further away to evade interception. The actions on this operation were mainly against the local Provincial Mobile Battalion, D445, which at this time was at the peak of its strength, morale and fighting capability. This unit, then one of the most highly trained Viet Cong units in South Vietnam, was subsequently met and defeated in the Battle of Long Tan and on Operation BRIBIE. The cumulative effect of those defeats was to whittle down to the present stage, where it is now believed to be disbanded as a battalion and is operating in company groups, under strength, in different areas of the Province. Of much greater import is the effect on the enemy's plans that this large-scale intrusion had made. The evidence of heavily used tracks, propositioned food caches, and the establishment of large-scale well-used camps of platoon, company and even battalion size substantiated our intelligence that the area was a constantly used transit area. The enemy will now be more than occupied over a considerable period of time to reproduce these facilities, apart from planning and organising a new route for movement of this formation. Tunnels and enemy camps of varying sizes were also destroyed.